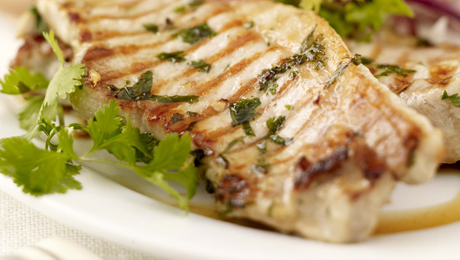 The combination of ginger and coriander works wonderfully with pork. This dish can be oven baked, grilled or cooked on the barbecue. Place the ginger, coriander, lime juice and olive oil into a little mini food processor and blend until a coarse consistency has been achieved. Pour this marinade over the pork chops and leave to marinate for at least 30 minutes but longer if time allows. Cut potatoes in half and place in a large saucepan of water and bring to the boil. Simmer until just tender. Strain off the water and allow to steam for a couple of minutes. Meanwhile heat a medium sized pan with a little oil, add the diced onion, garlic and chilli and cook quickly until softened. Pour the chilli mixture in on top of the baby potatoes, drizzle with a little oil and garnish with some chopped coriander.